Yesterday I went on my first ERV run. 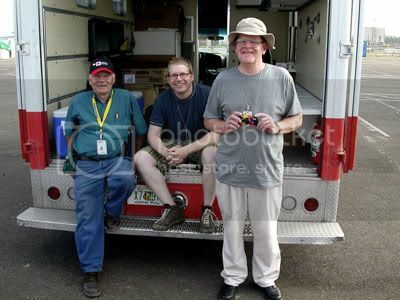 My teammates were two seniors, Elden C. and Jerry A.. (Normally, Elden drives with two “girls,” as he calls them, 60-year-old Joan and 50-year-old Smokey. But they had their day off, and were going around shopping and getting their hair done.) Elden drove while Jerry & I prepared and served meals. The lunch menu was barbecued chicken, while dinner was beef stew on rice with green beans and dinner rolls. Cold water, fruit punch, apple juice, and Squincher (a Gatorade-type “sports” beverage) to drink, with cookies for dessert. A word about Jerry. Have you ever seen the Jack Nicholson vehicle, About Schmidt? Jerry is Schmidt — crossed with Mr. Magoo. He’s a retired civil servant from Ottumna, Iowa (Radar O’Reilly’s hometown! ), whose hobbies are birdwatching, ham radio, and typing in Morse Code. (I kid you not.) He’s nearsighted, wears a big floppy “jungle” hat. and speaks in a slow drawl. (I’ve never heard so many accents. Besides the soft Southern accents of the Mississipian residents, we’ve got all sorts of Red Cross volunteers from the South and Midwest, where “country” accents abound.) More on Jerry later. Elden’s a retired electrician from southern Indiana. He’s quiet but kinda cool. He wears shades and has one of those pencil-thin pornstar mustaches. Kitchen 35 works like this. It’s set up off the main road in a Northrop-Grumman parking lot. We’ve got an administration tent, a kitchen tent, and about 20 ERVs. The kitchen prepares two meals a day — lunch and dinner — and packs them in giant plastic serving containers called Cambros. While they’re getting them ready, the ERV crews back their vehicles up to the loading area and stuff the truck with snacks, drinks, plastic cutlery, and other necessities. Depending on what else has been donated and what made it to our kitchen, we may also stock things like tampons, baby wipes, and the like. During today’s run, I actually gave out a big box of diapers and a Milk Bone biscuit to a guy’s dog. Anyway, once the ERV is packed up, with the Cambros locked into their slots in the serving area, we head off to our route. Yesterday’s route was the VFW Community, which is a mixed-race working-class area without major flood damage. Every house had significant wind damage, though, mostly roofs being ripped open plus some downed trees and power lines. But most of the debris had been carried off already and things don’t look too bad. Like what I’ve noticed with a lot of this region, the aftermath of the hurricane often leaves a community looking dilapidated and economically depressed more than devastated. I’m sure it didn’t look like that six weeks ago, but as things have started to settle in, the damage has acquired a “lived-in” look. As we slowly passed through the area, Elden used the loudspeaker to let the residents know that we were there with meals. He also gave highlights of the menu: “American Red Cross. Beef stew, rice, green beans. Hot meals. American Red Cross.” Before long, people popped out of doorways and came up to the truck. That’s when Jerry and I sprung into action, slopping the food into the “clamshells” (styrofoam take-out containers), and doling out the drinks, snacks, desserts, and utensils. Besides local residents, we also served the many work crews in the area. Couple of remarkable things. The neighborhood was more racially integrated than any area I’ve seen in my life, with white families living right next door to black families, right next to white families, and so on down the line. People just seemed very comfortable living next to each other in a way I haven’t seen in most communities. Very interesting, and of course very different than most of us Northerners are led to think. The other thing worth mentioning — as clichéd as it sounds — was how grateful everyone was. From the residents to the kids to the construction workers, person after person made a point of thanking us for and complimenting us on the food. It was incredibly gratifying to have that kind of personal interaction, to see people’s faces as they accepted our help. The only thing that marred the experience a bit was Jerry’s bumbling ineptitude. He just was not “with it.” He had trouble remembering to add the dinner rolls to each meal, he fumbled closing the clamshells, and he often forgot to offer drinks, snacks, and desserts. Worst of all, he was helpless with the “clients”. People down here are for the most part very polite, and they look you in the eye when they speak to you. Jerry is unfocused and basically sort of taciturn. He wasn’t exactly rude, but I just felt like he didn’t give it the extra bit of friendliness which was needed. The way I look at it is it must be very difficult to accept free meals — even if it really does make your life easier — and the nicer the person providing them is, the less undignified you feel taking them. I’m not talking condescendingly nice, just courteous and respectful. After all, that’s why we were motivated to come down here and help out — because we care. So that’s where I was sort of losing my patience with Jerry. But with a bit of coaching, we made it through okay, serving about 120 meals. After the lunch serving, we returned to the Kitchen. We unloaded the used Cambros, broke down our empty boxes, threw away the garbage, cleaned the Cambros with soap, water, and a power washer, and mopped out the ERV. Then we had about an hour’s wait while the kitchen prepared dinner. And then it was back to the routine: loading up the ERV, heading out on our route, and more mobile feeding. We got out a bit late and didn’t finish serving until after dark. Also, someone had messed up somewhere and we had way too much beef stew. You can’t save or store the stuff overnight, so I had the unenviable task of carrying a sloppy 40-pound plastic bag filled with the stuff to the Dumpster. Then we went through the whole cleaning cycle again, closed up the ERV, handed in our keys, signed out, hitched the shuttle back to base, and the day was done. All things considered, it was a terrific “first” day. Given my teammates, maybe it was a little slow and ponderous, but probably a sane introduction to the ERV-world. It’s definitely gonna be tough, and there will probably be many frustrating days, but I think I’ve found my calling for the next two-and-a-half weeks. I wish I ate that well! Are you going to be serving food on the same route for your entire tour? If so, you might could make friends with some of the “clients” and interview them for their hurricane experience and the affects before & after. I’m sure these folks have a lot to say about the USA. Thanks for the education and human interest, Josh. have i told you about the food at the seabee base? it is incredible! made for firefighters, so it’s packed with calories. all-american grub: meatloaf, chicken fried steak, fried catfish — i love it! Well, us cartoonists don’t fight fires with our ink so we gotta watch our waistlines. Ya heard? Nice to know each day yields something different. Keeps it fresh. Thanks for posting about your Red Cross experience. If you ever do make your way towards New Orleans, do look me up. I’d be glad to show you around to what’s open and give a rundown of what I know. have we met? anyway, thanks for the invite. one of my fellow volunteers is originally from new orleans, and we’re talking about going over there next friday. he wants to check out his grandma and uncle’s homes, which were pretty much washed away by the flooding. but maybe we could all hook up? my cell is 646.206.9909. We haven’t met before, but I did talk to Rob Walker awhile back. I put together a twice-yearly show called the Alternative Media Expo and tried to get him to pimp Titans of Finance at the Expo, so that’s how I’m familiar with your work. I’ll give you a call, or you can call me at 504-881-7508 or e-mail at leo@antigravitymagazine.com. Are you going to serve food in Brooklyn any time? Jerry got sent home after about four days. He says he had a note from his doctor saying he should be given “light duty.” The kitchen was unable to accomodate his request so he was sent home. My question is why someone would go and get deployed to Hurricane Katrina if they weren’t prepared to work hard?? ?